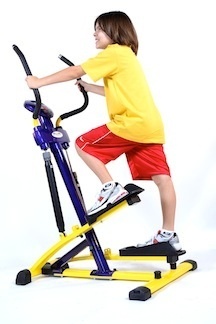 This stepper like all cardio kids products is built tough for heavy usage. Designed with an almost infinite adjustability for tension and speed control- the shock can be mounted in one of two positions depending on the average age of the user. PIncludes- adjustable shock settings, kids friendly computer (reads distance, time, calories, speed), Industrial grips.